EVANGELINE LOGAN WANTS a kiss. A spectacular, heart-stopping, life changing kiss. Somehow The Crimson Kiss (a romance novel she’s become obsessed with) and Four Steps to Living Your Fantasy (a self-help book she’s reading) have fused in Evangeline’s mind and sent her on a quest for a kiss. But the path to perfection is paved with many bad kisses—the smash mouth, the ear licker, the “misser.” The phrase “I don’t kiss and tell” means nothing to the boys in her school. And worse: someone starts writing her name and number on bathroom walls. And worst of all: the boy she’s just kissed turns out to be her best friend’s new crush. Kissing turns out to be way more complicated than the romance novels would have you believe . . .
Wendelin Van Draanen is the author of one of my favorite books ever, Flipped. I love Flipped — I have read several times and pushed to several people and even cried while watching the movie. I never really got around to reading the author’s other works, until I got it for a gift. It took me another year to read it (just like my other books in my TBR, heh), and I thought it would be the right book to cleanse my palate over reading something a little bit more serious. Evangeline Logan is a serial kisser — she knows it, and she justifies this because she wants one thing: a crimson kiss. The kind of kiss she read in the romance novel she found under her mother’s bed, a kiss that will turn her world around. So after a makeover, she goes to school and starts searching for that crimson kiss. How? By kissing boys of course. But it’s not turning out the way she expected it as rumors about her started spreading. As if that’s not enough, her best friend’s too busy and her two-timing dad is making a comeback. And she still hasn’t found her crimson kiss. What’s a serial kisser to do now? Going into Confessions of a Serial Kisser by Wendelin Van Draanen and expecting it to be like Flipped was kind of a big mistake. I wanted to like this more, but a third into the book I was very annoyed with Evangeline. I’m definitely not the kind of person who would do what she did, but let’s be honest now: who would do such a thing? How could she expect that she’d find that perfect crimson kiss by kissing random boys — by random, I mean strangers too! All because of a romance novel? Okay, that may be the entire point of the book — that you just can’t find a crimson kiss randomly — but Evangeline not expecting that she’d have a reputation after what she has been doing was just kind of naive. It’s like getting a pair sidi cobra boots: if you keep wearing them long enough, you’ll be known as the person who wears them. Evangeline reminded me a bit of Kelsey in Freshman Year and Other Unnatural Disasters, but I would be a bit more forgiving with Kelsey if she had done what Evangeline did because she’s still pretty young. I had to double check what year Evangeline was already in (junior to senior? There was a mention of emancipation at some point in the book) because I thought her attitude was kind of too young for her age. The chapters in this book are pretty short and they kind of remind me of my stories back in high school. It didn’t have the same fluid story like Flipped, and there were some plot points that felt a little too stretched out or a little too contrived. The guitar thing for example — where did that come from? Sure, she likes music, but the guitar thing just came out of the blue for me. Evangeline’s issues could have had more depth in it especially since I’m sure there are kids who are in the same situations, but I’m afraid it veered towards the shallow end with how Evangeline reacted with everything. And that boy who really liked her all along? I saw that coming a mile away. That being said, though, there’s an overall lesson in the book that wasn’t that bad, really. The book touched a bit on communication and forgiveness, which was pretty nicely done in the end. Evangeline’s penance was hard enough, although I wish she wasn’t such a whiny girl about it. How her kissing issues connect with her home issues was also explained, and at least that gives an overall hopeful resolution for them. It’s just sad that by the time those things came, I didn’t care about any of them anymore. 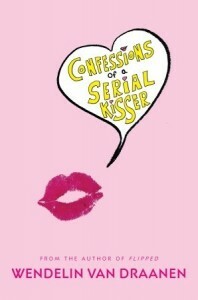 Confessions of a Serial Kisser could have had a good story going for it, but in the end I was just pretty annoyed with the main character and there was too much going on that I was just relieved that it was over when it was over. It was pretty fun (and I use the term lightly) sometimes, but if you’re expecting something like Flipped… well, better lower your expectations. But let’s try again. March is my favorite month because it’s my birthday month! I thought I’d turn over a new leaf as far as posting IMMs are concerned, so instead of a one-time big-time post, I thought I’d post in increments (assuming I get more before this month ends :D)! So here we go — my first birthday mailbox post! 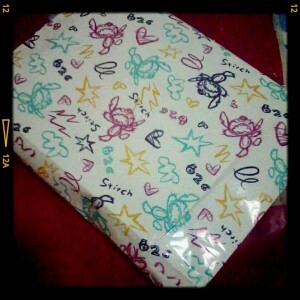 :) I got some really cool stuff recently, and some of them were things I was totally not expecting! 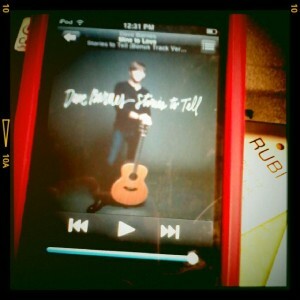 First, my favorite artist, Dave Barnes, released Stories to Tell, his newest album, the other day. :D Cue Squee here! Well hello there, favorite month! Okay, January was some sort of a reading high and I blame it on the newness of the year. 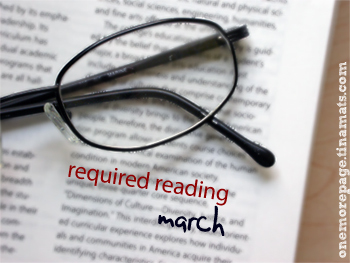 February was a different story — I don’t exactly know what happened, but I was a slower reader. Sometimes I could go for a day not flipping a book open. Books I normally finish within three to four days, I finish in a week. Maybe I was just too busy, but it felt weird to be reading a book for so long that isn’t even that thick. But I have another theory. I think I may have gotten soft. Remember, my Required Reading theme for February was zombies, and I thought I would just be able to jump right into the undead shambling goodness…but no. Believe it or not, the zombie books I finished left me…grossed out. The only zombie book I was partially grossed out with was Married with Zombies, and that was an apocalypse book. I thought I had a stomach made of steel from all the zombie books I’ve read…but I was wrong, apparently. Which led to my being a slow reader last month, I guess. I read a total of 9 books this month, which isn’t really that bad. But I totally missed out on Warm Bodies (I would have read it if I could, but reviews talked of gross parts so I thought I’d pass for now) and Game of Thrones. I really hope to find time to squeeze GoT soon! As for the TBR reducing challenge…gasp, my TBR still at 128. Ack. Most of them were galleys, anyway, and I only bought 3 books for February, two of them pre-orders while one is a secondhand book. Can I try to reduce my TBR to 125 next month? I hope so! The year is 2014, the year everything changed. We cured cancer. We cured the common cold. We died. This is the story of how we rose. 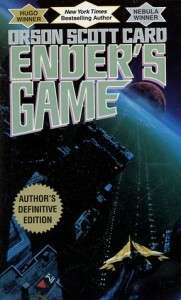 This is actually one of the last books I read for 2011, and I got this because I’m such a loyal reader of Mira Grant and her Newsflesh universe. Countdown is the a prequel to her story and it narrates just how the Rising happened through the different perspectives involved in the story. I liked how the story wasn’t really as simple as how it seemed when Georgia talked about it in Feed. There were so many people involved, some that were already known such as the developers of the cure, and also some unknown people like the activists that caused the virus to go out. It had just enough detail without being too scientific or too political, and the growing terror of what just might happen because of the chain of events was very well conveyed. The slow unveiling of the effects of the new virus strain was horrifying at its best and you just know that it’s too late when it all comes down. While there’s no Georgia or Shaun in this book yet, we get a glimpse of their parents and how they got involved and what happened that could have led them to adopting the two. It wasn’t really narrated as a whole, but when the book is done, it’s easier to connect the dots. 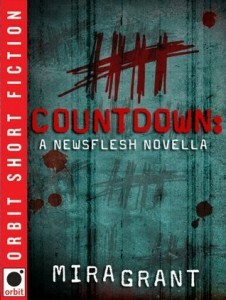 This isn’t a required reading to fully understand the series, but for fans who are itching to read the last book in the trilogy, Countdown is a good pick to satiate this hunger. Jerilyn and Jesse have lost their beloved older brother. But each of them deals with Jaron’s death differently. Jerilyn tries to keep it in and hold it together; Jesse acts out. But after a year of anger, pain, and guilt, they come to understand that it’s time to move on. It’s time for a new family picture-with one piece missing, yet whole again. Through the alternating voices of a brother and sister, Nikki Grimes eloquently portrays the grieving process in this gem of a book that is honest, powerful, and ultimately hopeful. I read and loved Nikki Grimes’ A Girl Named Mister so I was very excited to get this book from Kuya Doni during one of our Goodreads meet ups. A slim volume with illustrated pages, this is a book that discusses griefs and its different effects on people struggling with it. Jerilyn and Jesse just lost their older brother — too much too soon that they are at a loss at how to deal. Jerilyn holds it all together, showing an unruffled exterior but inside she is just as broken as how Jesse acts out. Questions about life, death and family surface and we get to see how the siblings and the rest of the family dealt with this loss. It will never be the same again, but it doesn’t mean they can’t be whole. Nikki Grimes’ poetry was easy to read and the illustrations were a good complement to the story. True to form, I found myself shedding some tears at a certain page, and I honestly cannot imagine losing my one and only brother too soon to death. While this book offers no solutions on how to handle grief and death and loss, it shows a hopeful picture that someday, it will all be okay. A pilot forced to land in the Sahara meets a little prince. The wise and enchanting stories the prince tells of his own planet with its three volcanoes and a haughty flower are unforgettable. I read this book sometime during high school, I think, not because of a school requirement but because people around me were quoting it and such. I remember being partly fascinated by it, but not so much to make it a favorite book. I just know that this book had a memorable line that everyone seems to know: It is only with the heart that one can see rightly. What is essential is invisible to the eye. I ended up reading the book again for our book club’s discussion, and seeing that it was a short book, I read it just a few days before the discussion happened. Still the same — the book had that whimsical feel, with the little prince’s innocence and stories bringing the pilot (and the readers) to wonder if this little prince was the real thing. 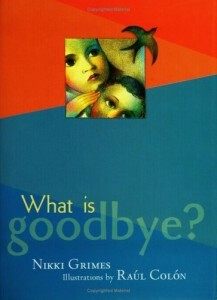 The book didn’t bring any new emotions, but it reminded me of just how sad I felt when I got to the end. 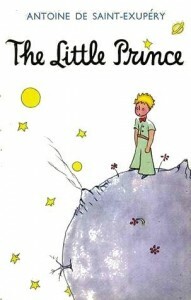 I remember not knowing the answer to the question: what do you think happened to the little prince? Nevertheless, the book gained more meaning to me after my friends and I had a very good (and brain-frying) discussion on it. Despite its thinness, The Little Prince is one of those books that pack a pretty heavy punch with its different adages that is pretty much applicable to so many things in life. I’d like to believe that people of all ages will be able to pick something interesting in this book, even if it gets a wee bit childish for older readers. After all, this was written as a children’s book. However, I would have to agree: the meat of the book really happens with the prince’s conversations with the fox. Don’t get me wrong — the rest of the book was pretty lovely as well, but if you need the most popular quotes in the book, just look for that chapter. It’s pretty much all there.